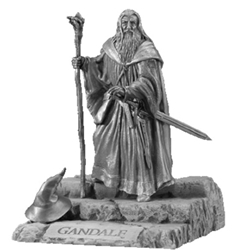 Our Gandalf Figurine from the Lord of the Rings depicts Gandalf as the Grey Wizard, before becoming the White Wizard. Gandalf was responsible for getting Bilbo Baggins involved with the dwarves to search for the treasure in the Lonely Mountains. And he was also the one that sent young Frodo on the quest to destroy the One Ring, and was also a part of the Fellowship of the Ring and fought in the final battle against the evil forces of Sauron.